Package theft is on the rise in the US. Last year, Shorr Packaging found that 31-percent of people have been personally victimized by package theft. 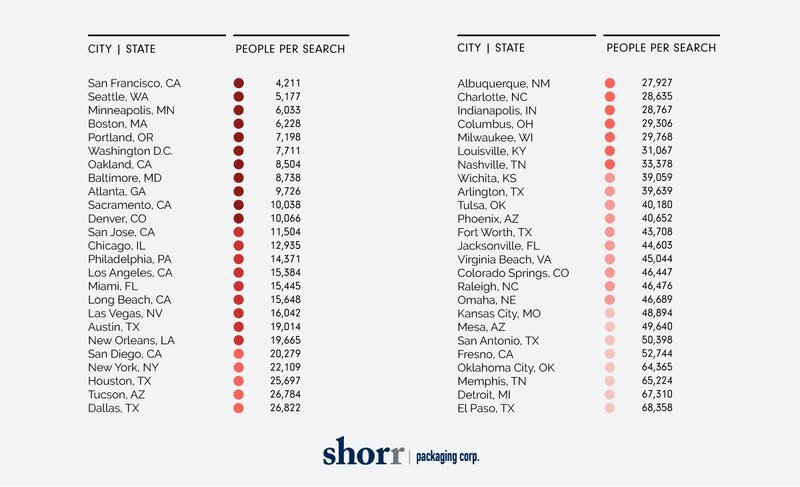 In their latest analysis of package theft trends, Shorr Packaging looked at the 50 largest cities in the country. Identifying the cities with the highest and lowest concentrations of package theft. The Google Trends data used in this analysis looks at the volume of searches for “Amazon package stolen,” in combination with US census estimates. With more and more people turning to Amazon and other online retailers, it’s becoming increasingly important for people to take measures to secure their belongings. 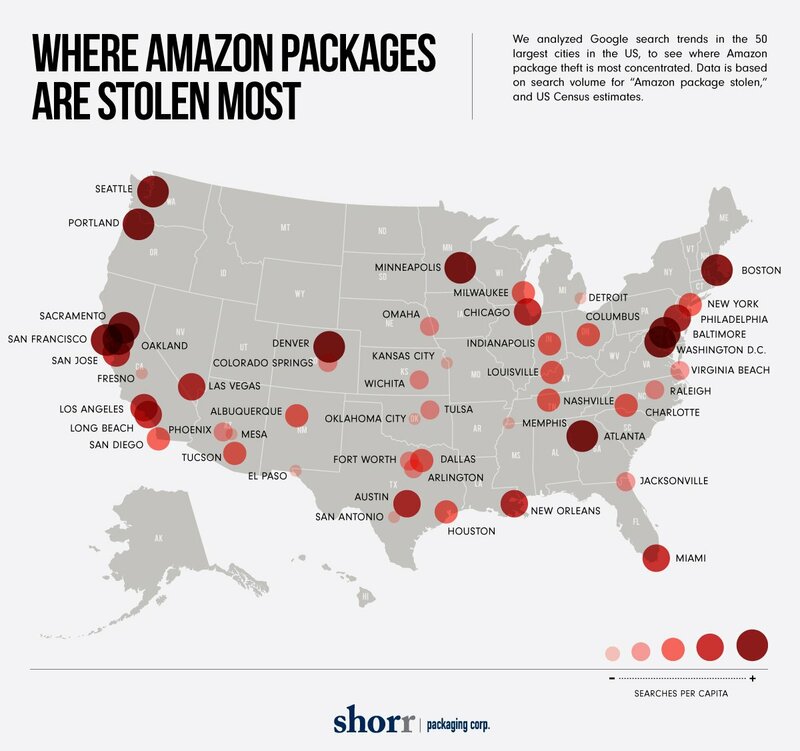 This analysis found that many cities with pervasive package thefts are among the country’s most notable technology hubs. San Francisco, California has the highest concentration of package thefts. According to Google trends data, there’s one search for “Amazon stolen package” per 4,211 people—that’s the highest concentration in the country. Seattle, Minneapolis, Boston, Portland, Washington D.C., Oakland, Baltimore, Atlanta, and Sacramento round out the top ten major cities with the highest concentration of package theft searches. At the bottom of the list, El Paso, Texas has the lowest concentration of package theft searches for a major US city. According to Shorr’s analysis, there is one search per every 68,358 people in El Paso—significantly lower than the top 10 cities on the list. In addition to the binary analysis of population and Google searches, Shorr checked the results against the FBI’s national crime statistics for city-based larceny-theft rates in each of the 50 cities. Many cities that the FBI identified as having high larceny-theft rates also showed significant prevalence of “Amazon package stolen.” Seattle, San Francisco, Portland, Oakland, Baltimore and Washington D.C. appeared on both analysis. There’s no geographic clusters of higher rates, however, there is some concentration in cities in California and the American north east, but those are also home to cities with dense populations and concentration of businesses. Some states—Idaho, Montana, Wyoming, Utah, North and South Dakota, Vermont, Maine—do not appear on the list as they do not have any cities with large enough populations.